Here are your New England Patriots, coming off a 14-2 season, and returning all their key players, while adding a new draft class, and veteran players such as Albert Haynesworth, Shaun Ellis, Andre Carter and Chad Ochocinco. Should be an exciting season, no? One to look forward to? Once again, if you listen to the local talkmasters on radio or television, you know that in reality, this team is in BIG trouble. Oh sure, the hosts will make sure they tell you once or twice a show that this team will finish 14-2 again and win the AFC East, but the other 99.9% of the time they are on the air, they’re letting you know that this team is a house of cards, just ready to be toppled by the slightest breeze. The Patriots can’t draft. That is crystal clear. Belichick tries to get too clever every year, trading around, and all he ends up with are stiffs. Every year. He’s completely lost his touch at drafting, and now that all the players from the Parcells era are finally gone, this team has no home-grown talent that they haven’t completely lucked into. Tom Brady’s window is closing. Unanimous MVP or not, he’s on the way down. He’s not the player he was when they were winning championships. Football isn’t his priority anymore. Globetrotting with his supermodel wife and his kids come first. His teammates wonder about his commitment. Even if Brady were still at the top of his game, the offensive line can’t protect him. Against a good or even decent line like the Jets, Ravens, Giants or even the freakin’ Detroit Lions or Cleveland Browns, the line folds up and Brady goes down. When Brady is getting hit he is an average or below average quarterback and the team can’t win. You think he’s going to repeat the miraculous season he had last year? No way. He’s good for double-digit picks this season. Running game? BenJarvus Green-Ellis is a pedestrian back at best. Danny Woodhead is on the verge of brain damage from the hard hits he takes, and then you have a pair of fragile, injury-prone rookies who couldn’t get on the field in training camp. Good luck with that. The receivers are aging. Did you know that Deion Branch didn’t catch a single pass in the preseason???? Welker is disgruntled about a lack of a contract extension, and Chad Ochocinco isn’t smart enough to pick up the Patriots offense and spends too much time Tweeting instead of studying the playbook. The other receivers have no talent and will hopefully never have to see the field. The tight ends will lose their focus this season after the team unceremoniously cut mentor Alge Crumpler. Bringing in another Gronkowski? Get ready for a frat party in the tight end meetings each day, and with Hernandez in that group, well, things could get illegal quickly. The defense? You do realize that this was the worst third-down defense in franchise history, right? Even those 1-15 and 2-14 teams weren’t this bad. They only survived the season because they forced so many lucky turnovers. That’s not going to happen again. Albert Haynesworth? You Patriots sycophants are willing to just give him a free pass on everything and think he’s going to actually be a model citizen here? He’s done. He can’t get on the field, he’s lazy, he’s going to have maybe one good game and then tank for the rest of the year. Shaun Ellis? You’re picking up Jets rejects now? Picking up players just because they had a good playoff game against you is no way to build a roster, Mr Belichick. Who’s going to rush the passer? The ancient Andre Carter? Sure, he looked OK against the scrubs of the Tampa Bay Bucs, but what’s he going to do against real offensive lines? Mark Anderson? They guy is a sieve against the run. They cut Gerard Warren? What are they thinking? The linebacker except for Mayo are a bunch of JAGS and Mayo himself is overrated. The team cut their best two safeties in James Sanders and Brandon Meriweather and are relying on an injury-prone Pat Chung, who single-handedly (along with several others) cost the team the Jets playoff game with his ill-advised fake punt call. That’s your leader in the secondary? Who are the other guys? An undrafted second year player? A guy you grabbed off waivers from the Broncos last year? Another Jets retread? Good luck back there. This team cannot beat the Jets. The Jets are in the Patriots head, that much is crystal clear. Fact, not opinion. Overall, you’ve just got to wonder about Bill Belichick’s commitment to this team. Did he try to load up this year, go all-in before he calls it quits? You have to admit, having the NFL Films documentary about him sure looked like he was trying to secure his legacy, Lombardi-style, before riding off into the sunset and taking the job he’s always really wanted, that of the New York Giants. How do you feel about your season now, fanboys? The media in New England is that bad? It is much easier to be a Pats fan in Washington DC where we can just watch the games and avoid the noise. The day-to-day beat guys are fine. It’s the columnists and on-air types that spout all the nonsense above. You forgot that the ‘Patriot Way’ is arrogant. – Remember when the Patriot Way used to be “smart” and should be copied by the rest of the league? Ahh, those were the days. Oh, and you forgot that the team is cheap. Now? These things are punchlines. Amazing. Not sure when exactly the paradigm shifted, but what used to be something to be seen as an example to all teams in sports, is now something ‘radioheads’ shriek about as a sign of arrogance. Satire only works if there’s truth in what you’re mocking: sadly, there’s truth in EVERYTHING you mock in this piece, because some of the media members covering the Pats around here really are that hysterical and negative. Too funny. And, unfortunately, depressingly accurate. Remember waaay back when in March of 2010 when all the screeching talking heads were tripping over each other screaming on a daily basis how the Patriots “HAVE NO TIGHT ENDS ON THEIR ROSTER, CALLER!! !” In freakin’ March. I’d say that Gronk and Hernandez worked out pretty damn good last year. So, now that they can’t play that card any longer, it’s on to all the latest chicken-little bayings as satirized above. Clowns. Every. Damn. One. Of. Them. We deserve better. We should all just go negative. Fans are stupid, right? Do some of the media people actually believe what they are spewing forth or are they really more concerned with creating traffic by offering “strong” (they would say unbiased/not wearing the homer glasses) opinions about the demise of this team. Not to mention this is a team that should get better as the season progresses. So, if they have some early struggles (which should be expected to a degree), these guys are waiting to pounce and say “I told you so”. I think you have it, Joe. With so much evidence out there about how consistently good the Pats are, why not be the doomsayer? At worst, people disagree. At best, you stir up “controversy,” which leads to traffic and some form of fame. I’d love to put a lie detector to some of these guys. I blame TV (Entirely Self-Promotional Network, of course) and the steady demise of the written word. Being able to make instant, anonymous comments hasn’t exactly raised the rhetoric. Imagine if the Pats had won three SBs in the 90s? The media would be going nuts over these guys a la the Celtics of the 80s, when Bob Ryan was firmly attached to Larry Bird’s hip. Now, every fan has to feel like Galileo trying to convince the Church that the Earth revolves around the sun: what seems obvious may not be clear to those who refuse to believe it. ‘why not be the doomsayer?’ You stir up “controversy,” which leads to traffic and some form of fame. You got to be kidding me; that takes talent? At least I give you a tiny bit of credit for admitting it. Only one of those sarcastic points is fact: The Pats really DON’T have any LB’s. In fact, I think they have one of the weakest LB corps in the league. I’m eager to see if Mayo elevates himself to the level of All Pro Playmaker this year in the D-Line heavy system. His Pro Bowl nod last year just seems empty (along with most of his tackles last year). I expect great things with him, that’s why i’m being a little harsh. 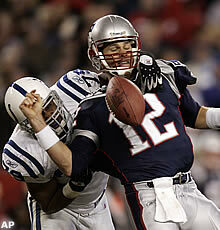 All i’m saying is, if I was the Pats weekly opponent, I would exploit that soft middle of the field. Classless – While I think the LB corps is thin (BB wants to go 4-3 for a reason), I wonder what you think of Spikes, Fletcher and Ninkovich? Pretty good across the board, no? Wait. This is a joke, right?